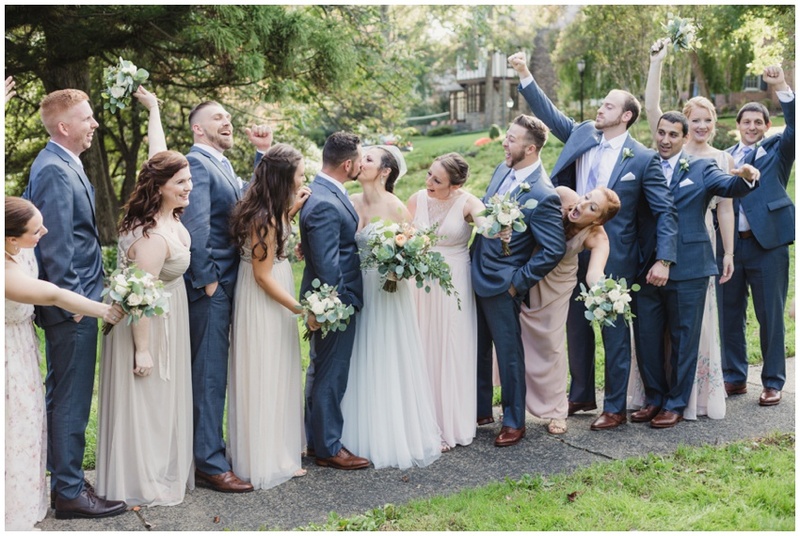 If you didn't already know, October weddings are the new black. And honestly, what's not to love about the Fall months? 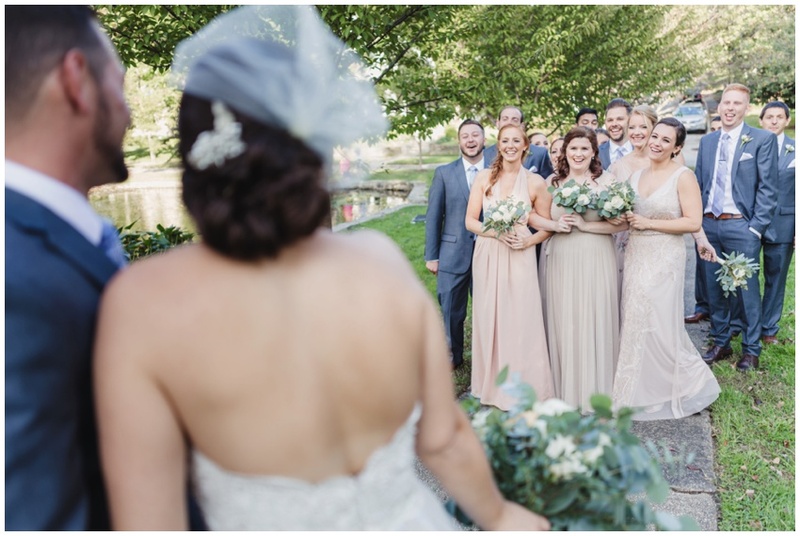 Between soft earthy tones in your bouquet, leaves still on the trees for your first look and temperatures that leave you comfortable outside all day long and into cocktail hour as the sunsets, it's a complete win-win for you AND your guests! 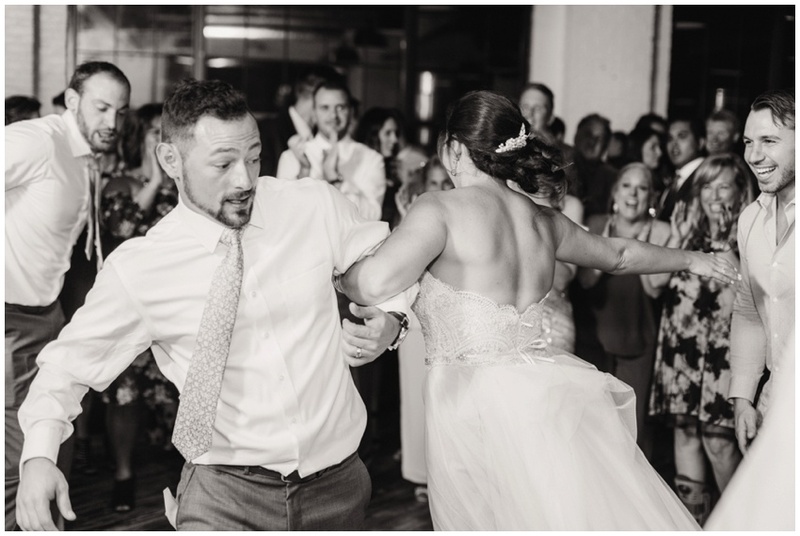 Courtney + Mike's wedding was our first at the Accelerator Space, one of Baltimore's newest wedding venues; 2017 was their opening year! This incredible venue sits just north of downtown Baltimore, south of the Senator Theater near Belvedere Square on York Road. I could go on and on about my favorite aspects of this venue, but that'll have to be a separate post... ;) let's just say the worn character-filled wood floor, the industrial windows (and multiple skylights!) let in the perfect amount of natural light to invoke a gorgeous glow during the ceremony and the elevated outdoor teak-enclosed patio sitting among the rooftops of the neighborhood, provide a beautifully designed retreat from the hustle and bustle of urban life yet with the charm, character and edgy modern look Baltimore should celebrate and show-off. It was quite a way to kick things off... these 2 sweethearts were so sweet and easygoing from the moment we met and I can't sing their praises enough! They incorporated so much personality and meaning into their wedding day... Courtney's bridal jewelry included a series of frog brooches since her grandmother loved collecting them, Mike designed and built their chuppah and the napkins at each placesetting were hand tied with eucalyptus by Courtney's mom, since greenery (and lots of it!) was the perfect choice to help soften the industrial chic space. I also absolutely LOVED that Courtney wore a fascinator headpiece. It added so much romance and timelessness to her look!!! I'm just going to put this out there right now: using eucalyptus as a theme throughout your florals is my absolute favorite and something that I hope never goes away. Please and thank you. Not just because of the beauty of it, but because it smells AH-MAZING, is so durable, versatile and striking, yet simple. Also: mix and match BHLDN bridesmaid dresses. DROOLING. SWOONING. REPEAT. Their family and friends were the absolute sweetest group and a lot of fun... how much fun? Just check out the groomsmen with their cigars and 'tude walking along the side of the Accelerator Space... (shoutout to the best second photographer in all the land - Anthony captured them and crushed some of my favorite groomsmen portraits)! 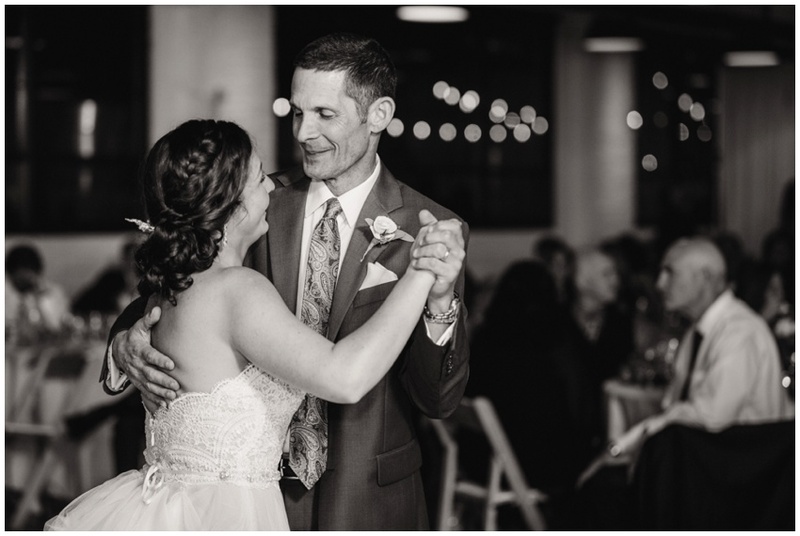 Father daughter first look emotions? Nothing compares. 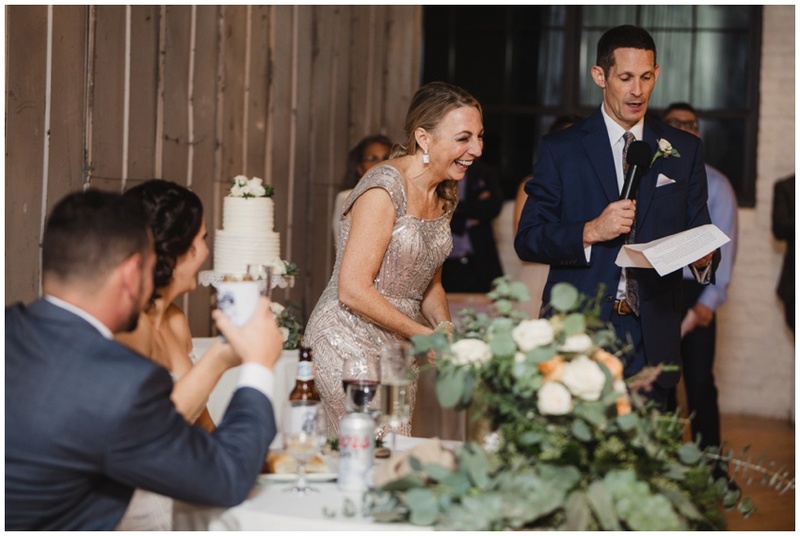 Well, the first look may run a close second... the raw emotion captured during every first look we've been a part of far outweighs anything I've seen when brides walk down the aisle. Just being honest. Private moments together are so few and far between on your wedding day, why not take advantage and preserve this feeling (with all of its anxiety, excitement and pure joy) for your grandchildren to see? I have to say the speeches were the most moving and heartwarming words I've ever heard during a wedding... not a dry eye existed. The theme of the night was F-U-N and when the evening culminated in the traditional Jewish hora dance, everyone was there! Jamillah of Taste This Cake made this beauty - her bakery is downstairs from the Accelerator Space, in B-More Kitchen! It doesn't get much more local and tasty than that. 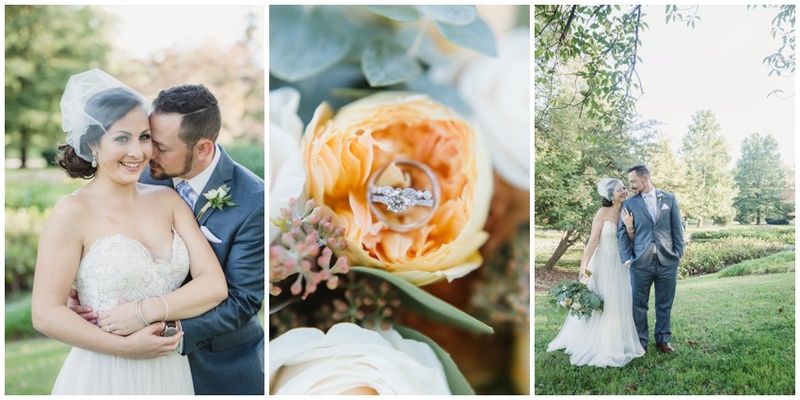 Courtney + Mike, I hope your marriage is as sweet and sentimental as your wedding day was! It was an absolute joy to be a part of your love story - we can't wait to see you grow old together... MAZEL TOV!! So many thanks to this fabulous vendor team!